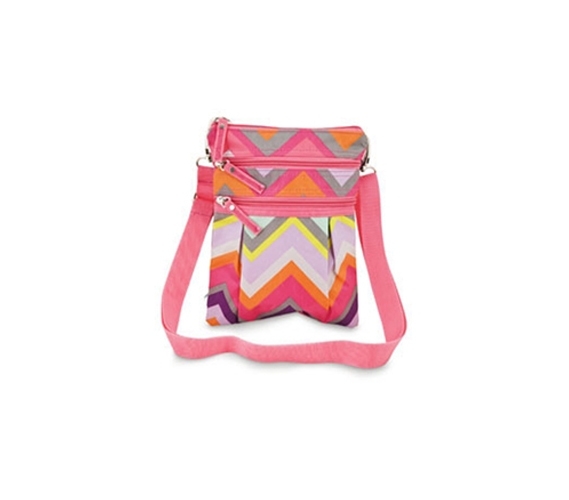 Take a break from shopping for dorm bedding supplies and other more boring college accessories, and check out our Chevron Crossbody Bag. You know you need a bookbag for college, but what you also need is a cute bag that can hold all of your essential college items. Our graphic pleated crossbody bag is cute, and useful. If you're thinking the last thing you need is another bag, you're probably right. But our dorm Chevron Crossbody Bag isn't just another bag. The crossbody strap of our bag leaves your hands free to carry books or coffee on your way to and from your dorm room to class. In college you always need to have your drom ID with you to get back into your dorm building. Our crossbody bag has three zipper pockets to carry your important items like your cell phone and license. And for those days that you just want a shoulder bag, the adjustable strap can shorten to the perfect length. Take a break from shopping for the college essentials, and get a cute bag that you'll use and love. College purses also make the perfect dorm gifts for graduating high school girls who love accessories. And what college bound girl couldn't use a cute new bag?